F�licitations tout est parfaits. Bravo pour la composition et la qualit� d'image. Beautiful shot. Very nice capture. Great composition and details. Tr�s belle image, belle composition.. So you've had a nice break away - very wise and I bet you've got lots of nice shots to show us. This is certainly a great start!! Lovely view of this beautiful Shrike with the long tail in its beak. I like its pose and the smooth background makes it really stand out. Brilliant shot! Great capture. Everything in this capture is outstanding. It comes close to perfection. Outstanding image. What a fantastic moment and you captured it very well. Perfect. What a moment you have captured! A tail is more than nothing! A perfect pose, pov, dof, great details and perfect composition. Welcome home to the winter, my friend. A beautiful picture wiht great details an lovely colour. Well exposed and great DOF, the bird standout well from th BG. Nicely composed shot with a good level POV and a fabulous pose with the bird and its lunch. Lovely colours and light too. Wow Mikael, this is great! Technically right on the money..
And what a nice catch with the bloodied end of the lizards tail seen so well. Jas� du har varit p� Fuerteventura! 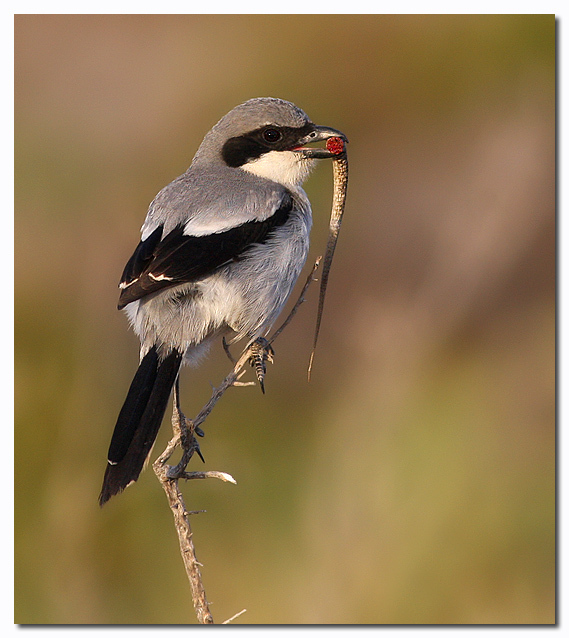 This is an excellent capture of the endemic Canary Southern Great Grey Shrike with a captured lizard tail. Technically fantastic and a great POV and pose. Into my favorites! An extraordinary capture and thanks for sharing it! Ser fram emot dine bilder, fr�mst p� Kragtrapp och den endemiska buskskv�ttan! P� l�rdag ska vi till Mallorca men det blir en vecka bara s� 500 bilder blir det inget snack om! Very good shot of shrike with good pose, composition and sharp details. Once more outstanding by subject and quality shot. I am impressed with all components of true photo art. Terrific image of the bird with food in the beak. Wonderful dry twig and of course, superb smooth colourful BG. Shot is composed by the best way too. My congratulations and TFS. Brilliant job. and of the cut-off lizard tail. Ugh! Excellent details... Love the colors in the BG. Can't wait to see the rest of your pictures from Fuerteventura. I can imagine it will be a lot of work to sort out all these 500 shots you've made at Fuerteventura. If all images are as great as the one you are showing us here, you must have had the time of your life and a superb completion on your already fantastic portfolio. Perfect composition, DOF, sharpness and exposure. Great details and very beautiful contrast. Wonderful pose of the bird and soft color tones in the BG. Excellent work. A real joy to look at. TFS!!! Everything in this photo is excellent: bird, tail, branch and BG. I'm looking forward to the next one. I want to visit Fuerteventura,:)) greetings friend. Awesome picture mate, excellent detail in the plumage, wonderful colours, well framed and composed, excellent separation form the OOF background, just stunning work. Wonderful shot of this Shrike with a mouthful. Pity about that owner of the tail. Immaculate sharpness and colours on its plumage and I like the way it lokks at you over the shoulder. Excellent DOF isolates it from the BG and a well chosen POV to portray it. Very nicely composed. Kudos. What a stunning shot, Mikael!!!! Incredible sight of this Shrike and a lizard's tail... I bet there are very few photos like this and even less that are as technically superb! Very good lighting and excellent exposure. Superb DOF and a perfectly blurred BG. Fina foto de este "Verdugo" Alta calidad de foto, hermoso detalle de la cola de algun peque�o reptil en su pico. Muy bello fondo y la pose tambien. This is one of the best Shrike images I have seen Mikeal. Splendidly sharp and colorful image, simply perfect. Thanks for sharing. Again a perfect picture; composition, subject, background, everything so pleasant. Amazing to see a bird holding a lizardtail in its beak. I just my praise here, no need to explain you why it is such a success.